1 Bribery & Corruption; 2 Labour & Workers’ Rights; 3. Sustainable Development; 4. Traceability & Transparency; 5. Health, Safety & Wellbeing; 6. Legality of Materials; 7. Complex/Manufactured Products; 8. Circular Economy; 9. Certification & Accreditation; plus 10. Openness & Communication. 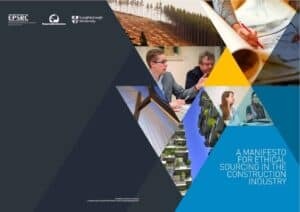 Tuesday 24 Nov saw the launch of the Manifesto for Ethical Sourcing in Construction, co-created in one of the first-ever industry applications of a ‘Hackathon’.